In the Etheric Realm over the beautiful Island of Crete, which lies on the blue bosom of the Mediterranean Sea, pulsates the Temple of Truth, focus of the Chohan of the Fifth Ray, and the Brotherhood of Truth, who serve with him in this particular branch of the Spiritual Hierarchy. Throughout many ages, great Spiritual Foci have been established from time to time on the surface of this Earth to enshrine Cosmic Virtues, whose Spiritual Radiation nourished the consciousness and feelings of the people. Temples have been built, the inspiration for which was usually to be found in the etheric realms, into which sensitive lifestreams tuned through contemplation and meditation. The Temple of Truth had been designed and perfected at Inner Levels. It formed the pattern for the Grecian masterpiece erected to Pallas Athena in 450 B.C., the Parthenon, the ruins of which still remain at the Acropois in Athens as a silent reminder of its glory today. Phidias (a past embodiment of our beloved Serapis), rendered a great service in bringing forth the almost exact replica of this Temple of Truth, so that the outer consciousness of mankind might contemplate its Perfection and tune into its Service to Life. The Temple of Truth is a meeting place for Great Intelligences who desire to magnetize and draw forth more of the Truth of Life from the Heart of God. This Focus is at present in the etheric realm, in the atmosphere above the ruins of the physical building. This building had been built during the centuries after the sinking of Atlantis, on what is now known as the Island of Crete - which was then a part of the mainland of what is now Greece. A portion of the Flame had been carried from the Temple on Atlantis in one of the boats to that location. 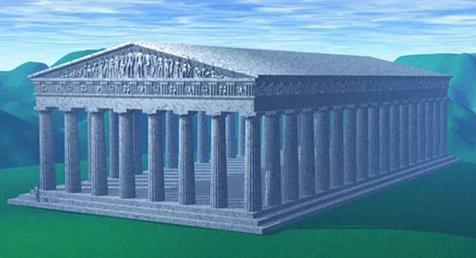 The building at Crete was very similar in structure to the Temple on Atlantis, with the large, tall columns, gracefully carved, and of extremely large proportions. Destructive individuals destroyed the physical building as the true Grecian culture declined. The etheric Temple is a replica of the former, but is very large. It has approximately four hundred beautiful marble steps leading up to the entrance door, which is between huge columns. The frieze all around the building is of gold. The Altar is around one hundred feet in height, with a large pillar, beautifully carved, on either side. The Flame of Truth is contained in golden braziers upon them. The Altar is entwined with green ivy; They usually use the ivy and calla lily-like flame-flowers for decorative purposes. The positions of the Brothers and Sisters of Truth are designated by mosaic patterns in the marble floor. After the building was destroyed there were the Delphic Oracles through whom the Truth was conveyed to seekers of Truth. The Oracles of the Delphi Order received their Truths from beloved Ascended Beings Vesta and Pallas Athena. This lasted for about seven hundred years before impurity entered in, through one individual, which resulted in the disconnection of the contacts with the Ascended Ones. Those recorded Truths are still held in the Retreat. Pallas Athena, the Goddess of Truth, Who represents Cosmic Truth to the Earth is patroness of this Focus. She was known to mankind in earlier ages and had a direct connection with seekers of Truth through the Delphic Oracles, until there was such perversion that She had to withdraw. The Brotherhood of Truth abide herein, directing the Flame of Truth into the consciousness of mankind for their understanding and acceptance which enables them to comprehend the eternal Truths. The Brotherhood give assistance to agnostics, the disillusioned, sceptics and doubters. Here the disillusioned regain faith, courage and strength. Hilarion and the Brotherhood of Truth direct from here the Flame of Truth to those calling for Truth. They enfold all messengers and missionaries going forth to present what they believe to be Truth. Religious teachers, Messiahs and Avatars are all members of this Brotherhood. Sincere seekers of Truth go to the Temple in their inner bodies while asleep. At the present time, the Temple of Truth plays host to the great spiritual teachers of many ages who have, from time to time, come forth and presented aspects of the one Law. These teach the spiritual aspects of the Truth which they promulgated while in embodiment and many of their constituents and general followers are enabled, in the fuller freedom of the etheric body, while their physical garments sleep, to sit at the feet of these Masters of Wisdom and learn the true Inner Spiritual Laws behind the various dogmas, creeds and faiths that presently engage the allegiance of men, women and children embodied today. The endeavors of Hilarion and His Brotherhood are to draw the interest and cooperation of the scientifically-minded lifestreams of earth into the exact science applied by the Creator of this Universe and His Messengers and Workers, whereby form is created and sustained and order is maintained throughout each galaxy, universe and planet belonging to the Divine Plan of God. In previous lives, Hilarion was known as Iamblichus, the neo-Platonic writer, and Saint Paul, the Christian Apostle and follower of the Master Jesus. This Brotherhood is also the self-appointed Guardian Presence of those blessed children of Earth who have devoted their lives to furthering the cause of scientific treatment and healing of disease, the doctors, nurses and missionaries, and those interested in research to determine the physical causes of the afflictions to which mankind are heir, as well as the vast army of unknown heroes and heroines who work in the research laboratories and privately, within their own homes, to develop and perfect inventions, formulas, and the many improvements which, added to the present developed comforts and conveniences of mankind, will hasten the freedom from limitations and privations of every kind and description. The minds and hearts of the bold explorers into the realm of the unknown are the recipients of the developed perfection of this Brotherhood, and many an earnest lifestream, who has endeavored, in vain, to draw forth the secrets of nature, has been the beneficiary of the concentrated rays of energy from a member of this Brotherhood, who chose to endow such an incarnate lifestream with the privilege of presenting that blessing to his fellowmen. The great Archangel Raphael, who is the Angel of Consecration, also has the focus of His Flame of Consecration in this Temple. Individuals who dedicate their lives to a specific beneficial service to mankind, are blessed by this beloved Archangel and the beloved Chohan, Hilarion, before taking embodiment. The primal life, which is magnetized by the soul into the heartbeat, is consecrated to service by the Archangel Raphael. He pours the Green Flame of Consecration through the electrons that flow from the White Fire Body, as the silver cord, into the physical heart. This life is, therefore, pre-destined to flow forth as directed energy to bless the humanity. All through their incarnations, lifestreams who are dedicated to vocations of service in fields of governmental affairs, education, artistic endeavors, ministry, medicine, missionary endeavors, etc. are guided, guarded and protected by either a member of the Angelic Kingdom of Lord Raphael's Legions or by a Member of the Brotherhood of Truth, under the direction of beloved Hilarion. The promptings and pressures which require of such men and women that they fulfill their professions are often directed from these Legions of Angels and Brothers of Truth who stand behind the selfless men and women upon whom the people rely for assistance in all constructive fields of endeavor. Beloved Hilarion, having experienced in his personal energies, the "self righteous" indignation that rises within a consciousness persuaded in itself that persecution is in order to right a wrong, upon His Ascension vowed to help all individuals with like erroneous complexes (Saul of Tarsus, who later became the Christian, Saint Paul). He has asked that you recommend to His Protection all those whom you know, as well as all those many unknown lifestreams, who have no faith in spiritual survival, in order that he may assist them to a correct understanding of Truth. He further asks that you recommend to the Temple of Truth in your calls and contemplations all the individuals serving in the many professions that they may be blessed, encouraged, illumined and prospered in their endeavors to help mankind. For this, he says, is his reason for being! The garments of the Brotherhood are white with bands of green on the sleeves and at the hem. Sometimes when officiating in ceremonies They wear robes of green. Embroidered over the heart is a lighted lamp, similar to the old fashioned oil cruet, from which emits the Flame of Truth. This symbol was incorporated into the activities of the Brotherhood by Diogenes, 412 B.C., at which time he was among the active members of this Order. This symbol signifies, of course, the relentless search for Truth, which is the vow and pledge taken by all members of this Brotherhood. The Ascended Master Hilarion is the Chohan in charge of this Focus. This is the Focus of the Fifth Ray for the Earth. The Flame of Truth is green with a white center. The White Flame taking the form similar to the calla lily (or tulip) forming the Flame-flower with bright Chinese Green Radiance. The hymn "Onward Christian Soldiers" holds within it the melody of the keynote of this Focus. Within this Retreat is one of the most ancient schoolrooms dedicated to the training of chelas in the magnetizing of the Universal Life, and the creating of consciously directed Rays by which form may either be created or dissolved, according to the requirement of the God Intelligences so invoking and directing them. Here is taught the mathematical precision by which suns, planets and individual atoms are created and sustained. Here also, the lifestreams are shown how, by controlled thought and feeling, the speed of atoms, the motion of the electrons and the duration of form, itself, may be governed. Here precipitation and etherealization become the developed faculty of the brother or sister desiring such a gift for the use of the forwarding of the progress of the race. In this Retreat is a great audience chamber, where the Master Jesus and representatives of the great religions that have blessed humanity, are given the opportunity of addressing those many lifestreams who either do not believe in God, as such, or who, through disillusionment and bitter experiences with teachers of religion in whom they trusted, not wisely but too well, have lost their faith and conviction in the Supreme Intelligence, the continuity of consciousness of the individual being, and the important part that each such self-conscious intelligence is to play in the great eternal scheme of things. If you know of any individual presently in embodiment or who has passed from this earth plane in confusion of spirit, you may petition the beloved Hilarion to seek out such a soul and draw that soul into the Aura and Presence of His Retreat and give back to such a one faith, hope and belief, in the All-Power of the Father-Mother God! Further, if the invocation to this Brotherhood of Truth could be made on behalf of the blessed doctors, nurses and individuals whose lives are dedicated to alleviating the distress of mankind, a member of this Brotherhood will conduct such a one to the sanctified Aura of this Retreat and bless him or her according to his particular requirement and according to the particular avenue of service to Life. Meditation music: "Onward Christian Soldiers"